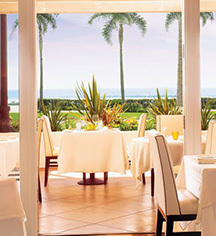 Inspired by its beachfront setting, Hotel del Coronado’s signature restaurant 1500 OCEAN spotlights the best in Coastal Cuisine with new menus from renowned Master Chef Patrick Ponsaty. With a resume of award-winning menus spanning countries to coastlines, Ponsaty sets a new era in fresh, unparalleled seaside dining at The Del. Start with a craft cocktail at the Sunset Bar overlooking the Pacific, and then venture inside for inspired seasonal cuisine paired with exceptional wines. Experience the warm ocean breeze and iconic California sunsets at the DELightful beachfront Coronado restaurant, Sheerwater. Enjoy fresh local seafood, savory smoked meats complete with house-made barbecue sauces and slaws, sandwiches and salads, plus an expansive breakfast buffet and a special kids menu. A true feast for the senses, the lavish Sunday brunch in the Crown Room features a chilled seafood bar, regionally inspired dishes, international cuisine, and carving stations. Guests can also enjoy a gourmet Bloody Mary bar, made-to-order mimosas, and a spectacular candy and dessert bar. 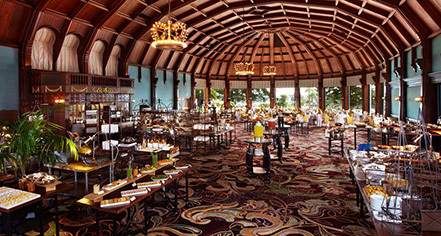 See what makes Sunday brunch at The Del legendary. ENO is an artisan pizzeria and wine bar in an energetic setting reminiscent of a neighborhood eatery, all served with a generous helping of beachside ambiance and ocean views. Whether a classic pepperoni lover or in the mood for artisanal arugula, goat cheese, and roasted tomato, gather around the outdoor fire pit or dine indoors and enjoy a wood-fired pizza and craft beer or wine while watching a majestic Pacific sunset. Or choose from a boutique list of California and international wines, including a few gems found only at ENO. This beachfront eatery is the ultimate destination for craft cocktails and coastal favorites. Relax by the cozy fire pits and savor delectable bites and drinks. With gorgeous front row views of the most spectacular sunsets on the West Coast, dining on the Sun Deck is an inDELible experience like no other. Dinner available during the summer months. Savor classic cocktails and casual bites at Babcock & Story Bar, a high-spirited, historic Coronado lounge named for the hotel’s visionary founders. Watch the game or catch some live music. Enjoy a coastal seafood platter or get adventurous with a house specialty like the Kate Morgan cocktail. Whatever the pleasure, this lively lounge serves up the Southern California vibe for lunch, dinner, and late night. On the edge of the Pacific, on the best beach in America visitors will find the incomparable Sunset Bar. A local favorite for friends and fun, this classic outdoor bar offers sensational sunset views, warm fire pits, stellar libations, and impeccable service. Ingredients for these specialty handcrafted cocktails and appetizers are seasonally selected from California’s finest for an incredible experience only found at The Del.